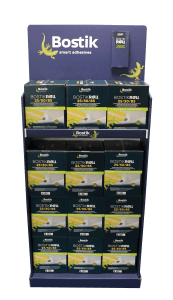 Distributors that stock Bostik Roll will now be able to present the product in a specially designed free-standing display unit (FSDU), helping to maximise sales in store. Supplied in ready-to-use rolls of three different widths, Bostik Roll is a reinforced, solvent-free adhesive tape for the fast installation of skirting, capping strips, cove formers, and other PVC floor or wall-mounted accessories. It provides an effective alternative to water and solvent-based adhesives and requires no curing time, meaning no waiting around.